Harvest when flowers are about 50% open. Plugs can be stored for 2 weeks in the dark (3 weeks in light) at 50F and subsequently grown into very acceptable plants and/or flowers. 39 or 45F is better than 35F. 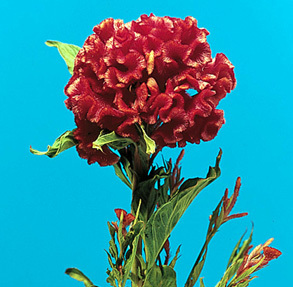 Celosia is from the Greek word “kelos” which means burning and refers to the brightly colored and character of the flowers. The variety name ‘cristata’ means crested. While not often grown as a potted flowering plant, Harbaugh and Waters (1979) reported that ‘Jewel Box’, ‘Golden Touch’ and ‘Kardinal’ performed well as potted plants under interior conditions. ‘Jewel Box’ is a favored cultivar and is available in mixed colors. Good as a dried flower. Remove leaves before drying. Redman et al. (2002) report that this species does not tolerate cold storage for 1 week at 35F and therefore should be marketed as soon after harvest as possible.